There are still more than a million Jews living in Europe, according to 2010 Pew Research Center estimates. But that number has dropped significantly over the last several decades – most dramatically in Eastern Europe and the countries that make up the former Soviet Union, according to historical research by Sergio DellaPergola of the Hebrew University of Jerusalem. Measuring Jewish populations, especially in places like Europe and the United States where Jews are a small minority, is fraught with difficulty. This is due to the complexity both of measuring small populations and of Jewish identity, which can be defined by ethnicity or religion. As a result, estimates vary, but Pew Research’s recent figures are similar to those reported by DellaPergola, one of the world’s leading experts on Jewish demography. 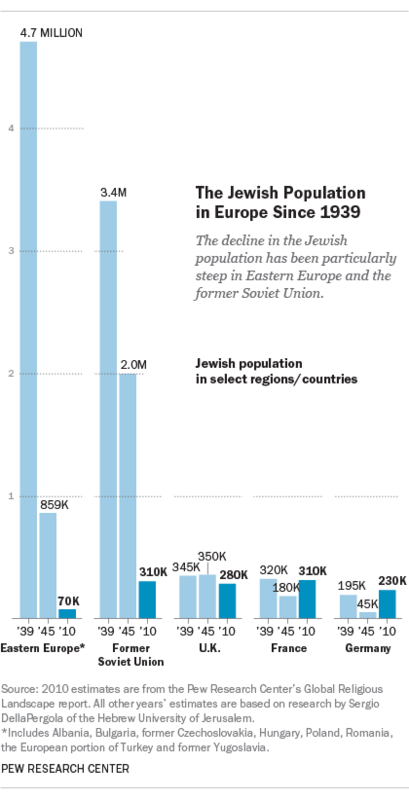 In Eastern Europe, a once large and vibrant Jewish population has nearly disappeared. DellaPergola estimates that there were 3.4 million Jews in the European portions of the Soviet Union as of 1939. Many were killed in the Holocaust, and others moved to Israel or elsewhere. Today, a tiny fraction of the former Soviet republics’ population – an estimated 310,000 people – are Jews. Similar trends have occurred in Eastern European countries that were outside the USSR, including Poland, Hungary, Romania and several other nations. Collectively, they were home to about 4.7 million Jews in 1939, but now there are probably fewer than 100,000 Jews in all these countries combined. Much of the postwar decline has been a result of emigration to Israel, which declared its independence as a Jewish state in 1948. The Jewish population of Israel has grown from about half a million in 1945 to 5.6 million in 2010. But there are other possible factors in the decline of European Jewry, including intermarriage and cultural assimilation. In addition, Jewish populations have not decreased uniformly in every European country. For example, we estimate that there were about as many Jews in France as of 2010 (310,000) as DellaPergola estimates there were in 1939 (320,000), although recent reports have indicated a surge in Jewish emigration from France. The United Kingdom also continues to have a significant Jewish population (about 280,000 in 2010, down from DellaPergola’s estimate of 345,000 in 1939). But a new report released this week found a record level of anti-Semitism in the U.K., with more than 1,000 anti-Semitic incidents recorded in 2014.